The inventors of CRISPR are alarmed that the gene-editing technology is being used to . . . edit genes? Really? In late November, the MIT Technology Review broke the news that a Chinese scientist, He Jiankui, used the gene-editing technology known as CRISPR to genetically modify human embryos. The embryos were then implanted, and earlier this year a pair of twin girls named Lulu and Nana were born. At least that's He's story. No one is 100 percent certain it actually happened. After all, there have been bogus claims of this magnitude before, most famously in 2004 when a South Korean researcher falsely claimed to have successfully cloned human embryonic stem cells. Despite their doubts, most geneticists have denounced He's reported actions, calling them, among other things, "profoundly disturbing" and "monstrous." While the assessment is correct, I'm struggling to believe their professed shock. It brings to mind a scene from the movie "Casablanca" when Captain Renault declares that he is "shocked, shocked to find there is gambling going on in here" even as he accepts an envelope with his share of the take. According to reports, He used CRISPR to deactivate a gene known as CCR5, "which the HIV virus uses as a doorway for infiltrating human cells." The stated goal was to render "the offspring resistant to HIV, smallpox, and cholera." You may be wondering what exactly is "monstrous" or "unconscionable" about that. Good question. This is exactly the kind of potential use for which CRISPR has been hailed as a breakthrough and a game-changer. Yet, that's not what happened. Instead, He and his team were reviled. Jennifer Doudna, one of the inventors of CRISPR, said that she was "horrified" at what He had done. Julian Savulescu, who has called the kind of gene-editing made possible by CRISPR a "moral necessity," called He's actions "monstrous." And that's only a few examples. They've made their feelings on the matter clear, but their reasoning is anything but. An article in the Atlantic entitled "The CRISPR Baby Scandal Gets Worse by the Day," cited at least fifteen "problems" with He's actions. But not a single of them was a moral concern, at least not in the sense that justifies words like "horrified" and "monstrous." The "problems" were mostly about informed consent and ignoring ethical guidelines. But in the field of bioethics, guidelines aren't worth the "ones" and "zeros" they are virtually printed on. As in the case of physician-assisted suicide, they're more like suggestions. To put it bluntly, in CRISPR, we've created a technology that, in Doudna's words, makes the genome "as malleable as a piece of literary prose at the mercy of an editor's red pen." This technology was released into the world with no limitations except the equivalent of "play nice." Well, what did we expect to happen? Making the outrage even more hollow is that Doudna and others foresaw this outcome. 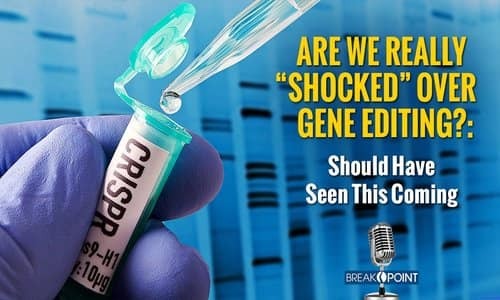 In her 2017 book, "A Crack in Creation," Doudna acknowledged the strong temptation to use CRISPR to create "perfect children," but settled for calling the prospect "disturbing." Had Doudna and others spent more time reading, they might have come up with a stronger word than "disturbing." There's no shortage of books about the virtually irresistible temptation to "play god" despite the risks: For example, Mary Shelley's "Frankenstein." Or H.G. Well's "The Island of Doctor Moreau." Or, if they're more film buffs than readers, they can watch one of Chuck Colson's favorite films, "Gattaca." When Vincent tells the audience that he will "never understand what possessed [his] mother to put her faith in God rather than her local geneticist," he summed up where technologies like CRISPR can and, absent very strict controls, will lead: a world where foregoing "designer babies" is a kind of child abuse. So, while I share Dounda and company's abhorrence of what may have happened in China, I reject all of the rhetorical pearl-clutching. They could not, not have seen it coming.